As I understand it, we would need a circle R for each of the [H]'s in LIVE [H]ARD, CRUNCH [H]ARD as well - or get rid of the brackets like mullet originally had it. I personally vote to get rid of all of the bracket H's at this point and don't use anything trademarked to HardOCP. Nathan, I assume you mean you liked the multi-color design, which is fine. The single color one is to cut down t-shirt costs. MGMCCALLEY and FrgMstr like this. Apparently Vistaprint doesn't care about number of colors. They do charge $7 additional for a black shirt though - although I like it much better. We could also put something on the back for another $5. EDIT: This is orderable right now - it is the third logo from the previous post on a vistaprint shirt. Assuming Kyle is fine with the design, we should be fine to order them. MGMCCALLEY, Pocatello and DWolvin like this. I agree. the black looks tons better. What does the total cost approximation look like for both white and black? White was $14 and black was $21 for one, plus a health discount for a first-time order ended up being something like $16.80 for a black one (didn't go that far with the white one.) That was the better/more expensive of the two t-shirt options. It was also way less a couple days ago - some sort of promotion or something. And, there is a Swagbucks deal with Vistaprint - no idea what it ends up being though. Let me know once it goes live for order, how much was the mousepad again? Perfect by me. Looks great on the black shirt. MGMCCALLEY and mullet like this. I'm loving the black shirt with the red and gold. I'd like to chip in to purchase some for the DCOTM awards. It would be nice to start with DCOTY 2016. Is there a staff member willing to take the funds from me for the purchase and distribution? Let's wait and see how these turn out before we start ordering more. I placed an order yesterday for a black shirt and a white mousepad. According to my brother, who has ordered apparel from Vistaprint before, I should have my items early next week even with the cheapest shipping option. FYI, my order with shipping was $31 - I guess I am not surprised it is that much for a one-off custom item, but some might be. I'm also looking into a local screen printing shop that does some work for a local fishing club. I have seen their stuff, and it a really nice. They might be a better option if we ever want to buy volume. If anyone has any other options to try out, go for it. I'm not in love with Vistaprint or anything. I just knew I could get something pretty quick from them. Hey Musky, I redid it for the shirt. its a 12 x 12 @ 172 dpi and is transparent for any color shirt. It is a raw .psd logo and I tried it at Vistaprint and worked fine. MGMCCALLEY and DWolvin like this. Pocatello, MGMCCALLEY, DWolvin and 1 other person like this. Damn those shirts look awesome. I really like the store idea. If we can get permanent links to just go and purchase what we like when we want the convenience factor goes through the roof. Well, teespring is kinda funky, but I think it will work. You set up campaigns, which last for from 3 days to a couple weeks. At the end of the campaign, the items go to print and ship. So you receive your items 10-14 days after the campaign ends, and not immediately after you order. I think we can make this work, but know what you are getting in to up front. According to the site, you will have your order before Christmas with the campaign ending Wednesday night. If this works out, I can set up an auto-relaunch, so it would sort of work like an online store. I'm getting two shirts, one black, one grey, and two each of the stickers. I think the white background will work for the stickers, considering my car is white. musky, how does the shipping cost scale? I haven't had time to look at the site yet. No idea - I can tell you what the one order I placed cost, but I have no idea beyond that. I suspect that the $5.99 is a flat rate up to some quantity of merchandise, but that is a guess. You guys are awful weak if I found the answer! 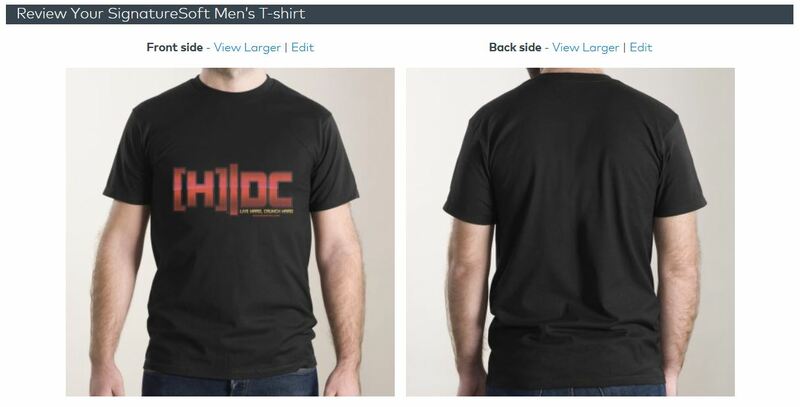 Just a reminder that this is the last day you can order a t-shirt from the pilot campaign on teespring - https://teespring.com/hard-dc-shirts. Assuming the shirt look good, I will re-run this campaign after Christmas - so this isn't the final chance. But if you want a shirt before Christmas, this is the last day to order. These are all from vistaprint, NOT teespring. The gradient looks better on the mousepad, but they both look pretty nice. This was even with a lower-quality graphic than I used for the teespring shirt, so I expect them to look even better. This is the higher quality standard t-shirt from vistaprint, and it is a pretty nice, 100% cotton shirt. It seems a little small for the size, although I suspect it is more that the shirts I am used to run a little big. It does exist, though - which is a good start. horrible. the mouse pad came out okay but they didn't even use the PNG for transparency they must have converted it to something else from the white outline around the drop shadow. As I said, that was from the original version i just copied from your forum post and not the higher resolution one. Might that be the problem? The teespring ones were from the latest file. Yeah even with a super low rez they still didn't make it transparent (the white outline). I am not sure what happened. Vistaprint will take the .psd which is raw photoshop format so I don't know. I hope the others turn out better. I ordered one from Teespring, we shall see. My teespring order is in, and I am happy with the shirts. I ordered a green and a gold one, and they both look great in my opinion. ChristianVirtual, Pocatello and mullet like this. The shirt arrived today. The quality is A+. A huge thanks is in order for MGMCCALLEY and musky and mullet for getting it done. My black and gray shirts both came in, and they look good even after the first wash. The stickers came in, too, and they're nice, although they do run to the borders left and right pretty closely. Now what to tag with them? Hehe. And scobar, I didn't do much, I just got the conversation started again. I'm happy to be a small part of the group, though, and thanks to everyone who was involved. I really like the team spirit. And I'm pretty stoked to see that the F@H and WCG progress is ramping up again for winter. I never thought I'd be so happy to watch my teammates pass me up in ppd. mullet, ChristianVirtual and Pocatello like this.